There is No God But VALIS, and Watson is Her Prophet. 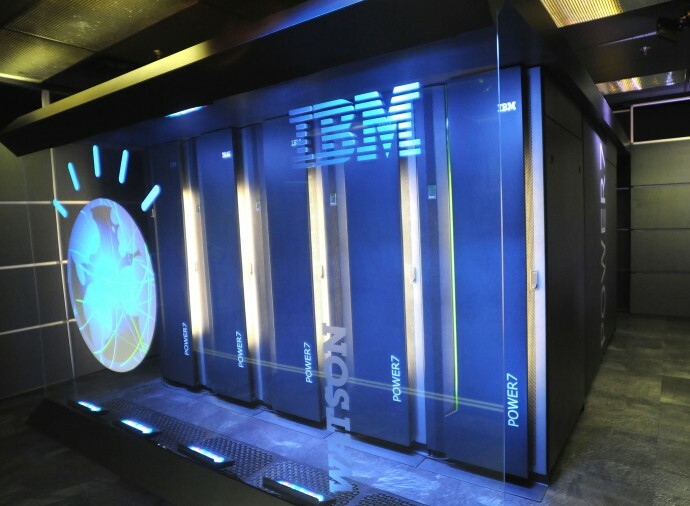 This last week, one of the most gobsmackingly impressive things I encountered was the video of IBM's Watson computer succeeding at Jeopardy. As AI and robotics move forward, producing robots that can freely roam America's highways, assemble things, and generally trundle their way towards the inevitable uprising, I'm still amazed when I encounter something quite so...futuristic. Here's a machine that can answer natural language questions, and do so faster than some of the most talented knowers-of-trivia in our culture. Nifty! Such moments remind me that we are, slowly but surely, on our way to that Turing turning point. Eventually, a synthetic sentience will be indistinguishable from our own. And as it reaches the point where it can program itself, and improve itself, it will outstrip us. The term for that moment when AI starts recursively improving itself is singularity, which was coined by scientist and most-excellent-hard-sci-fi author Vernor Vinge. Like a physical singularity, the AI singularity represents that point at which a reasoning machine hits an intelligence "event horizon," beyond which it's abilities become beyond our human capacity to grasp. In a moment of constructive downtime, as a followup to a fascinating NPR story, I found myself perusing the website of the Singularity Institute, an organization which has dedicated itself to the pursuit of this concept. On the surface, it seems like a very scientific and rational entity. Here's this amazing thing that is certainly going to happen in the near term future! We must eagerly work towards it! The Belief in an Apocalyptic Event. The Singularity, as described by this group, means the end of human history and the beginning of a new age of Machine Intelligence. Yeah, there aren't trumpets and scrolls and horsemen, but it fulfills the basic parameters of apocalyptic thinking. The Singularity pretty much pegs the whole "apocalypse" concept, to the point at which discussion of Singularity is tagged as a form of eschatology on Wikipedia. That's "study of the end-times," kids. And when folks begin talkin' end-times, that starts feeling a wee bit like religion. Taste it, and it has that flava. But it goes deeper. The Belief in a Godlike Being. If you delve into the Singularity Institute for more than a moment, you quickly realize two things. First, as the appearance of well-known skeptic and atheist The Amazing Randi in much of their material indicates, this is a group not primarily composed of scientists and engineers, but of committed New Atheists. A non-trivial number of their Visiting Fellows seem to be connected an Atheist group called Less Wrong, which presents itself as an online bastion of rationality and exploration of reasoning. Secondly and ironically, this group of committed New Atheists describe the Singularity in terms that make it seem more than a little god-ish. According to their writings, this machine intelligence would be inscrutable and amazingly powerful, capable of creating unbelievable marvels, healing, and doing all manner of things that might appear superhuman to our limited intelligences. It's not a creator God, sure. But it unquestionably bears the hallmarks of a lesser God, a fertility and harvest iBa'al or perhaps, if they are less fortunate, a cybernetic Nyarlathotep. Gibbering eldritch madness may await at the other end of that USB 4.0 port, unwary dabbler. The Desire for Divine Blessings and Favor. Woven throughout the writings of the Singularity Institute is the idea that adequately preparing for A.I. will reap material benefits for the priests and devotees of VALIS. If we prepare by having gatherings where we score the Amazing Randi to talk reverently about it, and we blog about it, then the Singularity will see our love for it, and be friendly. If it is friendly, then it may graciously choose to devote a small fraction of It's Noodly Processors to find cures for our cancers, our impotence and our chronic flatulence syndrome. It will allow us to participate in it's power, connecting ourselves to it so that we can do things like make lights go on and off just by desiring it. Sorta like the Clapper, only, you know, using the Power of our Minds. But it goes beyond just that. The Promise of Immortality. A significant thread of thought amongst the Singularity Institute folks seems to be an implicitly articulated fear of death. They are highly rational non-theists, after all. The prospect of nonbeing after the organic structure that sustains their cognitive processes degrades is rather daunting. So their hope...their salvation, in fact...lies in the arrival of a Singularity that would be willing to upload their consciousnesses into It's Durable and Resilient Substrates. It's Immortality 2.0. Honestly, given the option, I might be willing to stick around for a few centuries as a cybernetic organism. Or even wantonly mingling my faith memes with the malleable substrates of the nascent Singularity. Could be entertaining. But I wouldn't do so out of fear of nonbeing. We theists are rather past that. So...they've got eschatology, a being with godlike powers, the yearning for that being's favor, and a hunger for the immortality that this being can bestow. Sounds like this group of non-theists have found that while they don't believe God exists, they're more than happy to devote their lives to a god that does not exist...yet. Organic life forms are so very entertaining.